Maximum freeboard for comfort in the hulls, but a tall rig for good performance, even in light weather. 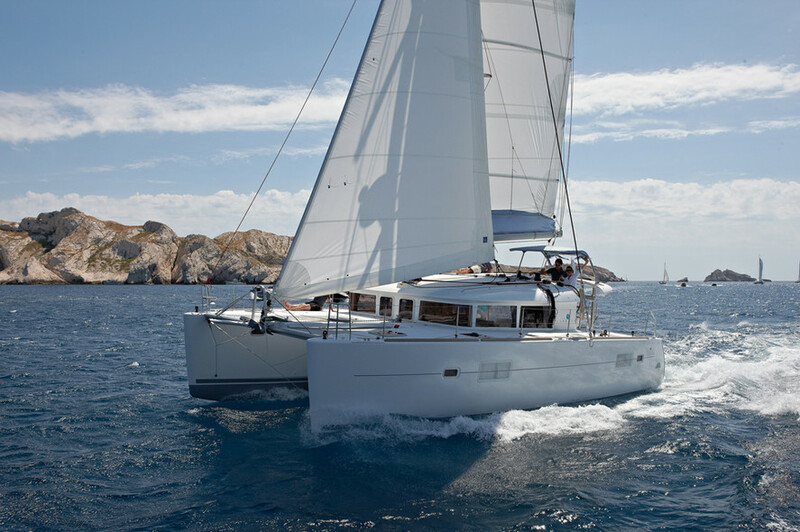 Launched in 2009, the 400 is still in the world’s leading catamaran builder’s catalogue... But as over 500 examples have now been sold, it is already a standard on the second-hand market. Create a notification for "Second-hand test"
Compared to most 40-foot catamarans, the beam of this 400’s hulls and its high freeboard are impressive...yet after the 100% comfort-oriented 420, which motored well, this model marks a slight backward step in the bid for more volume. Here, whatever the purists may say, an eye has been kept on the performance aspect, with a tall rig (taller than that of a Nautitech 44), a square-headed mainsail (it was an option, and we recommend it!) and 100% sailing hulls. Indeed the sail area/weight ratio is 8.16 m²/t, whilst the ever-popular 380 displays 10.61. But we are dealing with a very beamy platform: 7.25m as against 6.50 for the Lavezzi 40, its competitor at the time. Have a look between the hulls: you will find a very carefully designed surface under the nacelle, perched 50 to 70 cm above the sea. While maneuvering in the harbor, you will however have to beware of the significant windage with the wind on the beam. As for the rest, by playing with the two gearboxes, the 400 is very maneuverable. The builder offered two 29 hp motors as standard, and a pair of 40s as an option. As for sail handling, many models are equipped with electric winches. All control lines – sheets, reef pendants and others – converge on the steering position, fitted at mid-height on the aft end of the coachroof. 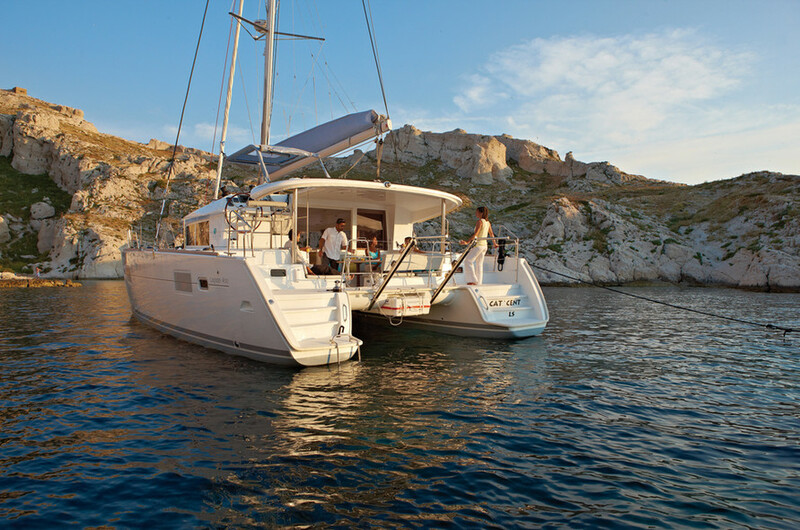 The helmsman’s seat is big enough for two and is protected by a removable bimini. Visibility from the steering position is good. Although the 400 doesn’t enjoy very light weather, it comes to life from a force 2/3 upwards, and the helm is sensitive. To windward, it will quickly reach 5 knots, but the pointing angle is not so good. There is no point in trying to point high: rather settle at 60° to the true wind, and sail the boat well; this is how you will obtain the best VMG. From a close reach, the gennaker on its bowsprit offers a significant gain – so it would be a shame to go without! In a good breeze, the 400 easily manages 8 knot average speeds. With a good swell on the stern, it can even surf at 12/15 knots. Apart from this decent performance, we remember the 400’s seakeeping qualities. For Jean-Pierre Frery, a Lagoon dealer who knows the 400 particularly well, this model is an excellent vessel for leaving...to sail a very long way. It’s clear that for this ocean cruising program, the 400 does not have too much close competition among the 40-footers: few models offer such a pleasant life aboard. What convinced Eric Bouhanna, 55, whom we met at the Escapade Lagoon in Porquerolles, France, was “the superb interior, the very clean finishing and the large volume for living aboard”; he lived aboard for over a year and is dying to do it again, but for longer! Lagoon 500 One of the best choices for getting started. And with a flybridge as an added bonus! Corneel 26 A cat for pure pleasure!